We, Wilhelm, by the grace of God King of Prussia, do herewith declare that we have considered it a duty to our common fatherland to answer the summons of the united German princes and cities and to accept the German imperial title. 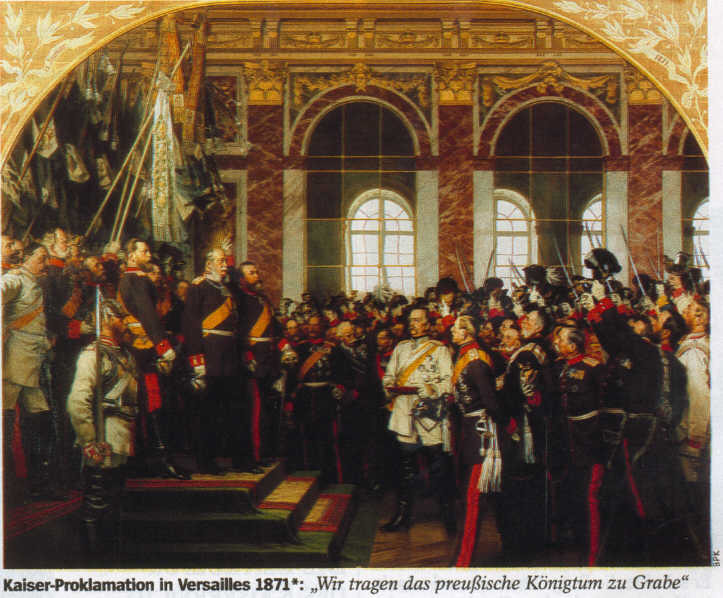 In consequence, we and our successors on the throne of Prussia will henceforth bear the imperial title in all our relations and in all the business of the German Empire, and we hope to God that the German nation will be granted the ability to fashion a propitious future for the fatherland under the symbol of its ancient glory. We assume the imperial title, conscious of the duty of protecting, with German loyalty, the rights of the Empire and of its members, of keeping the peace, and of protecting the independence of Germany, which depends in its turn upon the united strength of the people. We assume the title in the hope that the German people will be granted the ability to enjoy the reward of its ardent and self-sacrificing wars in lasting peace, within boundaries which afford the fatherland a security against renewed French aggression which has been lost for centuries. And may God grant that We and our successors on the imperial throne may at all times increase the wealth of the German Empire, not by military conquests, but by the blessings and the gifts of peace, in the realm of national prosperity, liberty, and morality. We take great care and pride in creating our products. We certainly hope that you'll find something in our catalog which you like. In some cases, such as embroidred Regimental Flags, we can create custom orders. Please email and let us know what you require. Please refer to the "Contact Us" page for more information on terms, payment, and shipping information. Prussian Glory Miltaria is proud to offer a full range of museum quality reproduction artifacts, produced by artists and craftsmen, the world over. Our product line will be of great interest to collectors, historians and aficionados of Imperial Prussia. It will include fine quality, custom made uniforms, headgear, equipment and supplies. In addition, we will also offer an extensive range of textiles, including full-size regimental flags, fanfare trumpet banners, sabertasche, and kettledrum covers. We hope you enjoy the wonderful treasures found on these pages.